Tenzin Gyatso is the 14th Dalai Lama, the latest in a long line of reincarnations of Avalokiteśvara, the bodhisattva embodiment of compassion. He's also an insufferable homer who loves free hats. 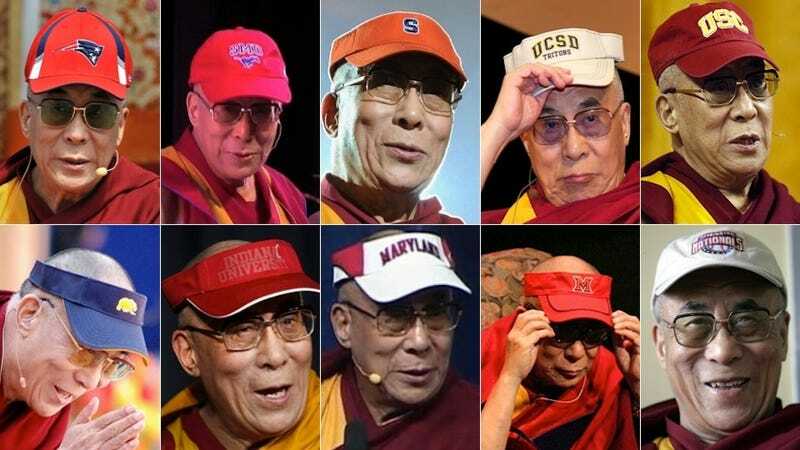 Inspired by this morning's visit to the University of Maryland, at which he donned a Terps visor, we went back through the archives to see if we could pin down the Dalai Lama's loyalties. He's a pure mercenary, just wearing the colors of the home team wherever he goes. Psh. I bet he didn't even go to UCSD.